He might look all brawn, no brains. 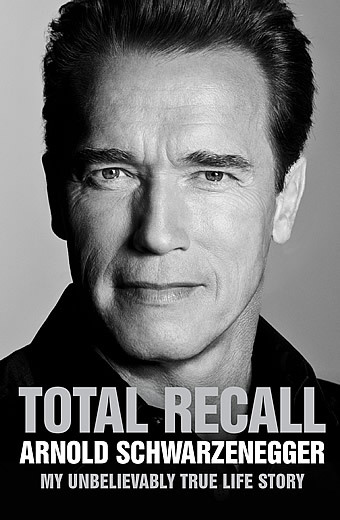 The actor turned governor Arnold Schwarzenegger’s first official memoir, “Total Recall: My Unbeliveable True Life Story” detailed his humble beginnings in Austria to his post-governor days in this 646 pages memoir co-written by Peter Petre. Since this is his own autobiography, Schwarzenegger is entitled to be a braggart. He proclaimed he drives the first civilian humvee and smoke only the finest Cuba cigars. Though he did express on hindsight it was not beneficial to the sport upon winning Mr Olympia again in 1980 amid controversies, he has no qualms talking about his glory body-building days which he devoted over eight chapters to it. You can call him an overconfident man or again a braggart. Throughout, Schwarzenegger has always maintained a stay hungry mentality. He went into real estate without much knowledge except he is good with numbers since young. He married a Kennedy despite the two coming from different backgrounds. He is a well-known action hero before he went into comedy with Danny DeVito and earned millions. Even though against the advice of the people around him, the man has the brains and balls to attempt something drastic so long he sets his mind on it. But coming from a perspective as a fan of his movies, this book fails to delve much into his hits and misses Hollywood career. With an initial in-depth talk and discussions about his early movie career which involves the never released Hercules in New York, his debut in Conan, how he gets involved in James Cameron’s The Terminator and some snippets aboutPredator andTwins, Schwarzenegger sounds he is much more keen to talk about his “loving” relationship with Maria Shriver and his political doings which again took up the bulk of the memoir. Schwarzenegger likes to have fun since his rebellious childhood and youth days in the Austria army as a tank driver, those expecting scandalous openings about his many rumored affairs will be disappointed as well as he probably categorized these as plain fun. Even his affair with his housekeeper resulting in a 14 year old son that killed his marriage is sparsely mentioned. “Total Recall: My Unbeliveable True Life Story” is more or less just a list down of Schwarzenegger’s success in America. He has rubbed shoulders with the rich and famous including ex-President George Bush, the late Richard Nixon, married a Kennedy, became the governor of California and still remains a big Hollywood star. It makes for an entertaining read, contributing nothing more to the screen presence as we always known him for. Arnold Schwarzenegger last seen in THE LAST STAND will star opposite Sylvester Stallone, his once friendly rival in ESCAPE PLAN opening on 24 October 2013.